Preprints offer a way to share your research quickly, receive feedback from the community, and gain a wider audience for your work. 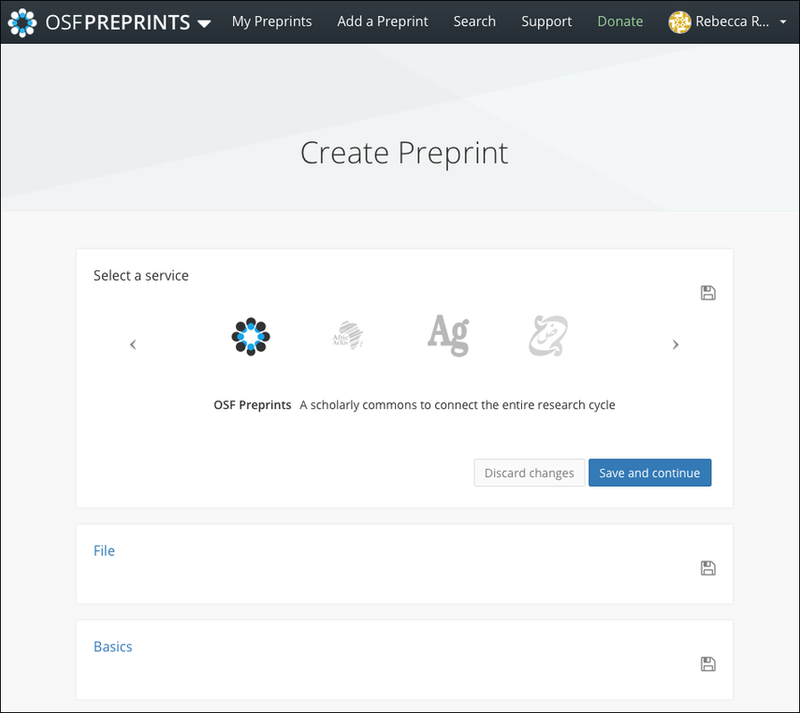 OSF Preprints and the community preprint services follow the same upload process. Read our Preprint FAQs to learn more about preprints. 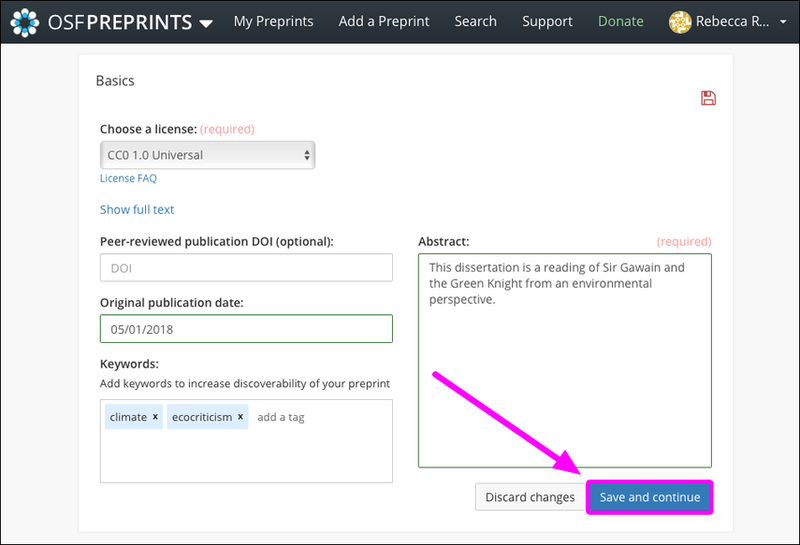 All preprints receive a DOI and persistent URL to allow your preprint to be cited, and the option to add supplemental files, like data or analysis scripts. 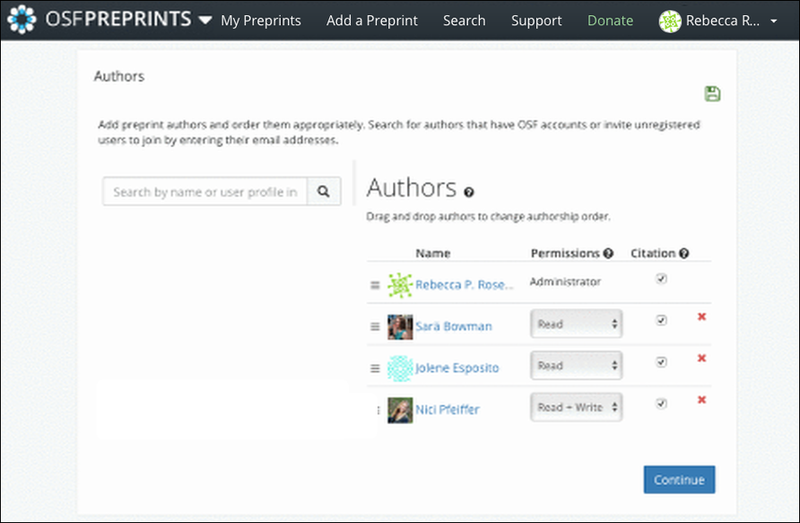 First, navigate to OSF Preprints or a community preprint service. Then click the Add a preprint button. You will be taken to the submission page. 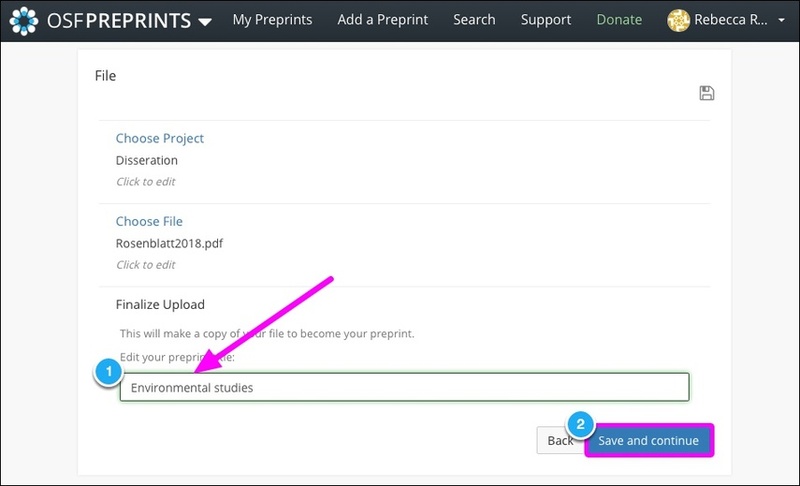 Select the preprint service to which you want to upload your preprint. 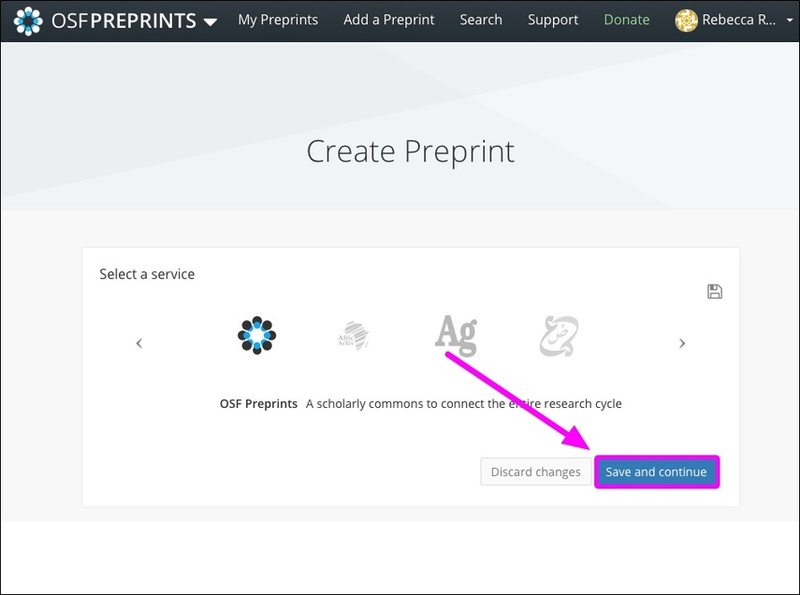 OSF Preprints will be selected by default. Then click Save and Continue. Uploading PDFs is recommended. All file types are supported and most render in browser. 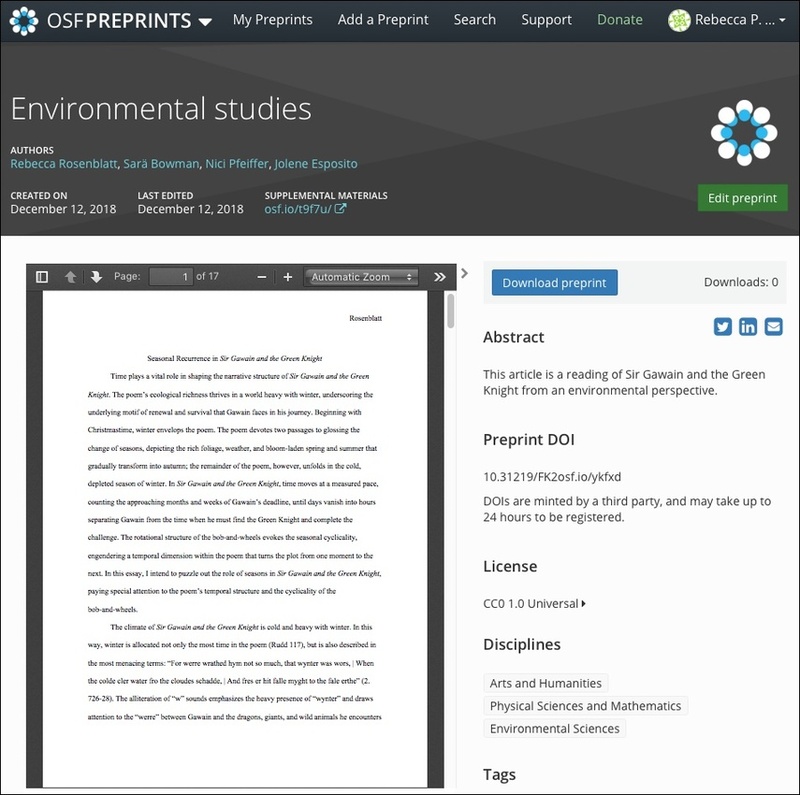 Next, upload your preprint file either from your computer or from one of your existing OSF projects. Click the Upload from your computer button. 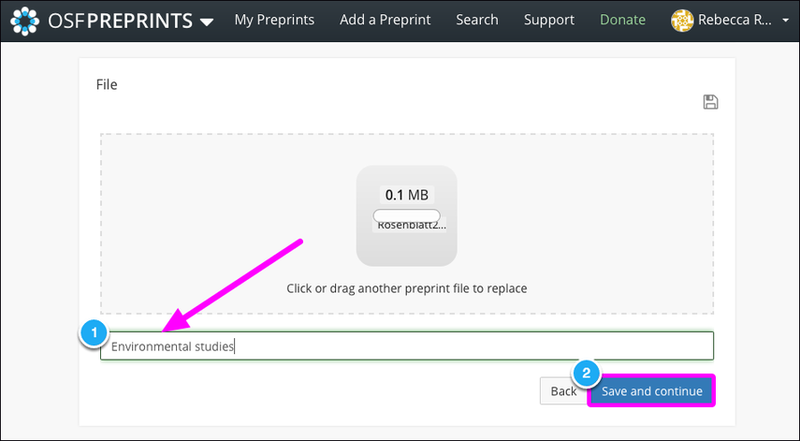 Either drag and drop your preprint file into the upload box, or click inside the upload box to select a file from a dialog box. Enter a title for your preprint into the textbox that appears. Note: The preprint filename is permanent and cannot be changed or edited after the preprint has been submitted. Then, click Save and continue. Is the file you want to upload already stored in an OSF project? 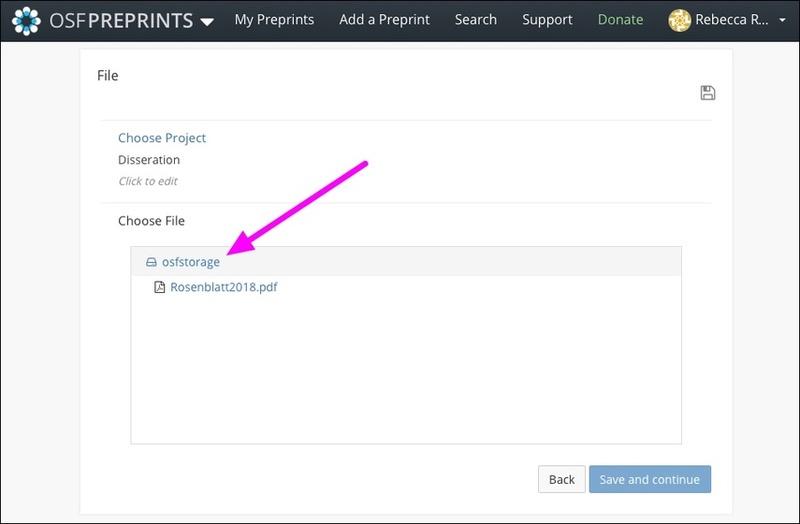 Select this option to upload an existing file from one of your OSF projects. Click the Select from an existing OSF project button. Select the OSF project from the drop-down menu. Files stored in the project's OSF Storage will appear. Select the file from the file tree. Next, enter a title for your preprint into the "Title" field. Next, fill out the "Basics" section: select a license, enter a publication DOI (if applicable), include the original publication date (if applicable), add keywords, and provide an abstract. 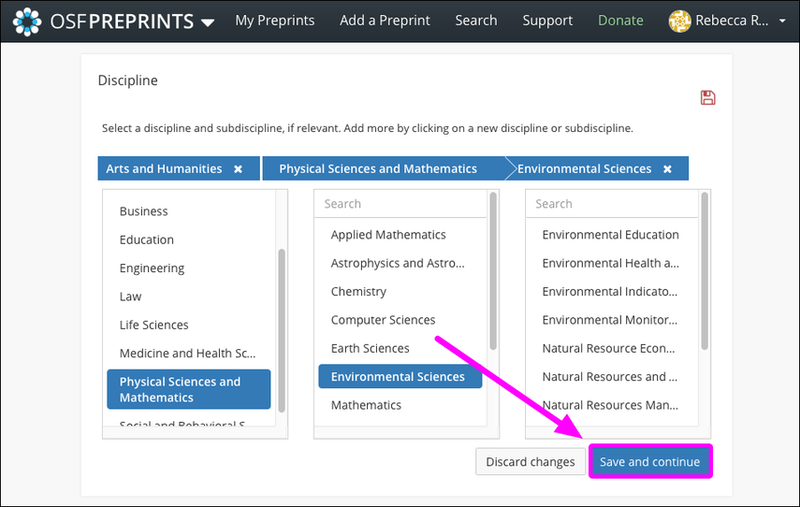 Adding disciplines to your preprint will enhance discoverability of your work. The list of disciplines will vary by preprint service. Select at least one discipline that corresponds to your preprint. Read: The author can view the preprint but does not have permission to edit. Read + Write: The author can view the preprint but does not have permission to edit. The author can add supplemental files. 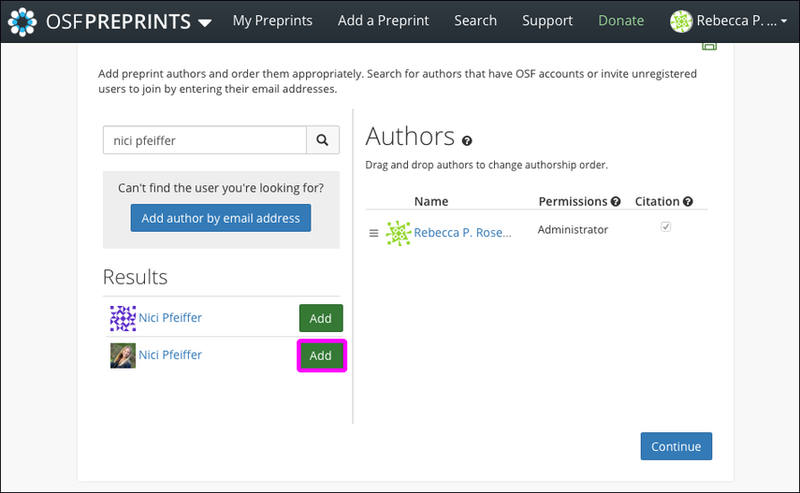 Administrator: The author can view and edit the preprint, add supplemental files, and manage authors and permissions. If a co-author does not have an account on the preprint service, they can be added as an unregistered user. If a co-author already has an account, they can be added as a registered user. 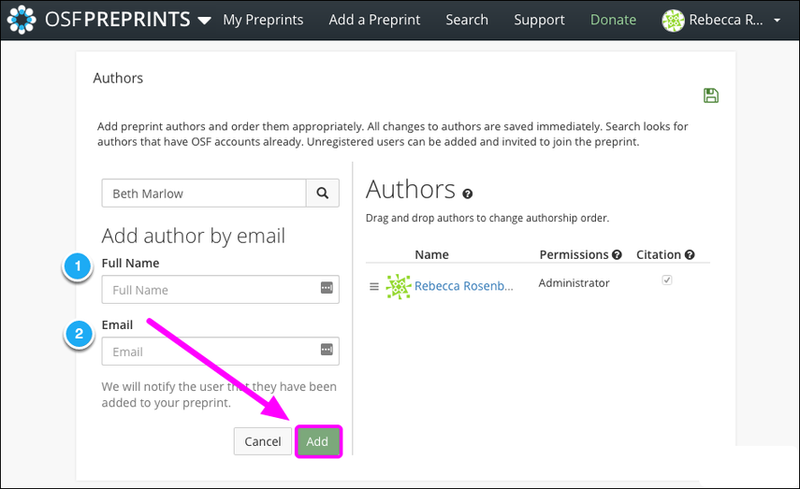 Use this option if your co-author doesn't have an account on the preprint service. Type your co-author's name into the search box, then click the magnifying glass button. Click the Add author by email address button below the search box. Next, enter your co-author's name into the "Full Name" field and their email address into the "Email" field. Your co-author will be added. Next, select their permissions and choose whether they should appear in citations by checking or unchecking the box in the "Citation" column. Use this option if your co-author has an account on the preprint service. 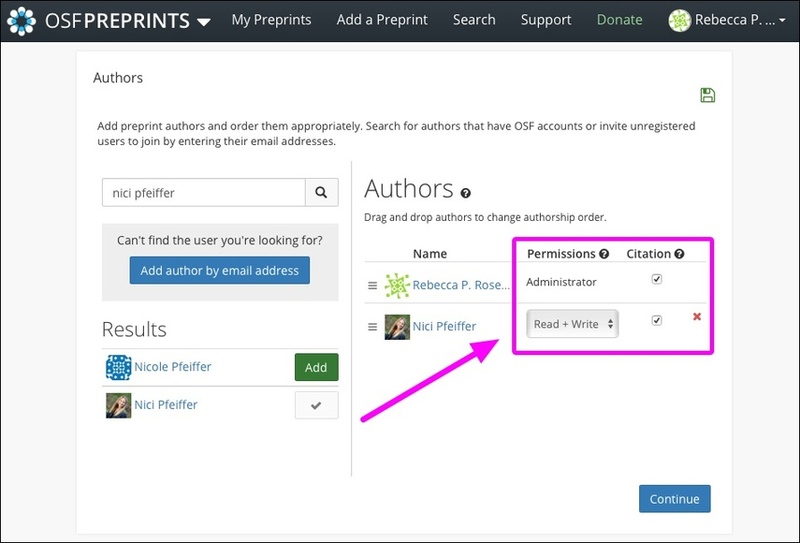 Enter your co-author's name or OSF profile information (ORCiD ID, Twitter handle, GitHub username, etc.) into the search box, then click the magnifying glass button. Find their name in the search results, then click the Add button next to their name. The order in which your authors appear in the "Authors" list is the order in which they will appear in citations. To reorder authors, click the icon with three bars, then drag and drop the authors into the correct order. Do you have supplemental materials that you want to add along with your preprint? Are the files already stored in an OSF project? Or do you want to upload the materials later? Select one of the workflows to add supplemental materials. 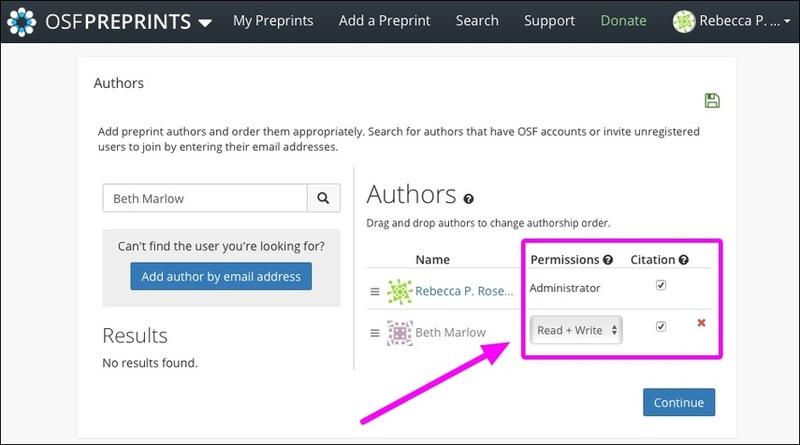 Next, you can add supplemental materials to your preprint by storing them in an OSF project that will be connected to your preprint. Choose this option if your supplemental materials are already stored in an existing OSF project. Click the Connect an existing OSF project button. Then select a project from the drop-down menu, and click Save and continue. Click the Create a new OSF project button. A default title will be given to the project. The title can be modified in the "Project title" field. Read the instructions at the bottom of the page, then click the Create preprint button. A modal will appear asking you to confirm that you want to share the preprint. Click the Create button in the modal. Your preprint will be uploaded to the selected preprint service. You will receive a confirmation email upon sharing. Your co-authors will receive an email notifying them that they have beed added to the preprint. A preprint service may use pre- or post-moderation, in which case a moderator will review either accept or reject your preprint. Your preprint will have a "pending" status indicating that it's being moderated. Learn more at Submitting to a Moderated Preprint Service.